Creating More Happy Coincidences | Happy Cards - Happiness & Kindness Cards! I find that serendipity and synchronicity, two of my favorite words in life, are signals that we are in tune with the stream of cosmic or Divine consciousness. Our paths and awareness sometimes align in ways that reveal small echos of the Universes Divine love for us. When we start to live from our true core selves, being compassionate loving and honest with who we really are, especially seeking to create value in the world for others and contribute to the greater good, we can start to hear and see these happy echos. I believe they are signs to tell us we are on the right path and encourage us to continue. It’s like being tuned into the right radio station. I experience them sometimes like what happened just the other day. I said an affirmation (a positive statement affirming the good I want in life) as I got out of bed in the morning “today’s going to be very prosperous”. I always start each day with a positive grateful thought. I’ll share more about how you can create this awesome powerful habit in a future post. So right after I utter the word prosperous I turned on my radio beside my bed and the voice on the radio said “prosperous times for some”. So the last word I said as I stepped off my bed in the morning was prosperous, and the first word on the radio that very next moment was prosperous. I smiled and thought ahhh there it goes again! More happy coincidences. Most would not have noticed this “coincidence”. But I’ve grown more attuned to these moments of synchronicity. Happy coincidences are like most things in life, when you look for them you’ll find them. Sometimes it happens like that from a radio or TV program where the very word or subject your talking about is said or shown. Other times it might be some actual sign on a roadside while driving that mirrors what you’re talking about or a sign on the road like “stay clear”. Once driving in Pasadena California, I let a car in the lane ahead of me that nobody else was letting in. I was angry they didn’t thank me or wave as I thought they should have. I said “God why do people never acknowledge a good deed?” Just then a big 18 wheel semi truck changes lanes in front of me and painted on the back of it were giant bold letters spelling out THANK YOU! I’m not kidding, this really did happen! I saw it, laughed out loud. And I said Okay okay God I get it. This life, this is the thank you you’re giving me for living like a good person. That’s the type of synchronicity that can happen when we start to wake up and tune in! 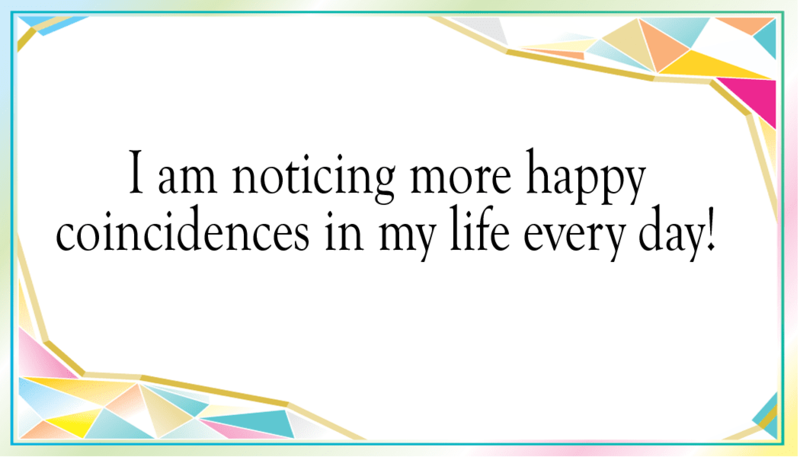 Say this affirmation from our new Affirmations & Incantations For Happiness program as often as you can. And while you say it remember a time when some happy coincidence or pleasant surprise happened in your life. Use your feelings and images while you say the affirmation. I share more about how to make affirmations work well for you in our new book included in this new happiness program. These moments happen to encourage us and keep us awake in life. Stay encouraged! Stay awake! Stay loving! Please leave a comment below about any happy coincidences you’ve experienced in your life. Thank you!